One of the most popular tours in Alaska, the White Pass and Yukon Railroad, has provided exciting trips through tunnels, over trestles, and beside waterfalls since 1898. If you’re arriving in Skagway via cruise ship or automobile, it’s a great starting point to experience history of gold rush days and take in spectacular scenery. Combining a ride on the railway with kayaking on a glacier lake provides the best of both adventures. Settle into vintage seats of the restored coaches on the narrow gauge railway. 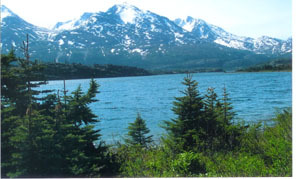 The train picks up speed as it heads through the Skagway River Valley, dotted by willows and birches, until it reaches the tree line at nearly 3,000 feet. Glacial silt has turned Skagway River water a cloudy gray, but it moves swiftly, even kicking up some white caps. Columbine, dogwood, wild geraniums, and lupine colored the landscape against a backdrop of mountains. The train’s narrator gives a running commentary on gold rush activities in the Yukon territory during the late 1890’s when many Americans trekked North in pursuit of a dream. Skagway, where the Chilkoot and White Pass Trails began, became the gateway to the Yukon. 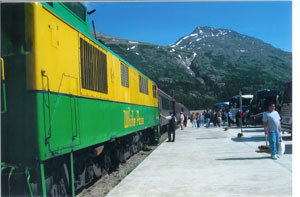 As the train travels from tidewater at Skagway to the summit at White Pass, passengers learn how construction of the railroad was a boon for Skagway, bringing in 35,000 men for a 26-month period. Continuing through the snow and cold of winter, many workers hoped to earn enough money (at 30 cents an hour) to join the gold rush. Required costs added up: $1 per man, $10 per horse, 2 cents per pound of supplies (1,000 pounds required for a year’s maintenance). Since the White Pass trail was not as steep as Chilkoot, most folks chose it, even though it was longer. Of 100,000 prospectors who left Skagway, only about one-third even made it to the Yukon, and very few got rich. The train passes Gold Rush Cemetery, commemorating those who died along the way. At Dead Horse Gulch in the valley, we pass the spot where 3,000 horses, weak from starvation or overwork, fell off the trail into the river and died. Strong currents rushing into level six rapids that have never been navigated make imagining this tragedy easy. At mile 14, we start up a 36-degree incline, rising quickly to 1800 feet where evergreens grow abundantly, although somewhat stunted, in the thin acidic soil. Soon the train arrives at pristine Lake Bernard, located at the edge of historic Fraser in British Columbia. After disembarking, our kayaking adventure begins. Guides give expert instruction and a safety briefing to our group of seven. All required gear is provided. We slide onto our seats, zip up the protective covering designed to keep us warm and dry, and paddle into glacier-carved Lake Bernard. Smoothly we glide across the same cold, clear water that Klondikers had paddled more than a century before. 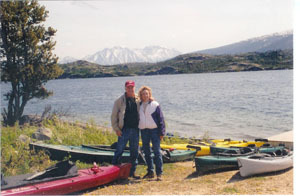 From our stable, two-person kayaks, we marvel at vistas of snow-capped mountain peaks rising all around the lake. Following our guides, we paddle to several coves and stop to admire alpine plant life, while gentle waves and occasional small rapids keep us alert. Resting our paddles, we reflect on the serene setting and breathe in crisp mountain air. This day we do not see wildlife, but some excursions do get glimpses of bear, mountain goat, caribou, or eagles. Passengers need passports because the train ventures into Canada. We booked the combination scenic railway and kayak tour from the Coral Princess cruise ship or contact Klonkide Water Adventures, Skagway-983-3769.